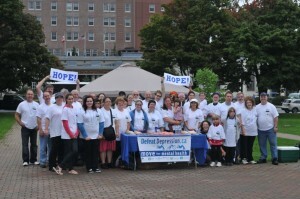 The Defeat Depression Pan-Canadian Mental Health campaign is the only national multi-organizational, family based mental health campaign consisting of walks, runs, rides and other physical and social activities. 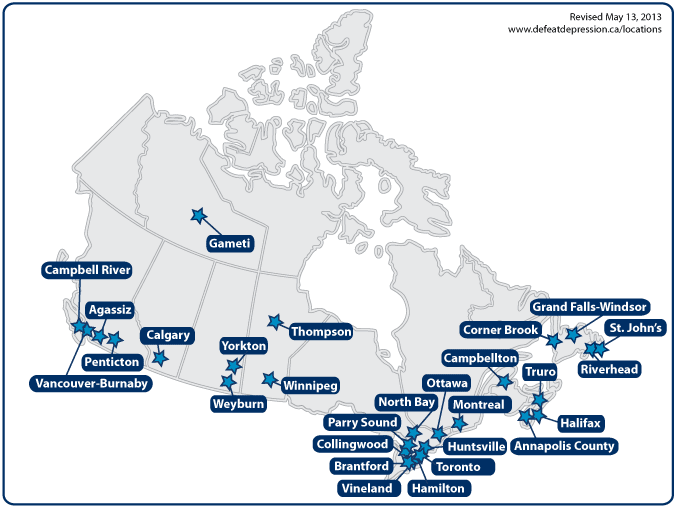 These events are held in cities and towns across Canada and raise awareness of depression and other mood disorders and reduces stigma. The Defeat Depression Mental Health Campaign involves dozens of mental health organizations throughout the country. 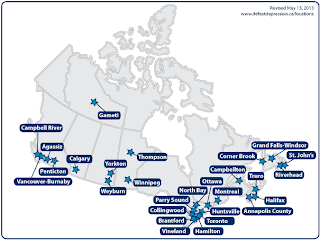 The campaign saw its first events in May of 2012 when 23 cities and towns and thousands of Canadians from coast to coast took part in inaugural events. 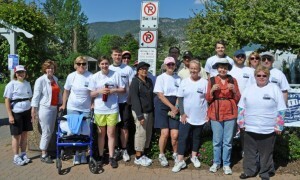 Families, mental health organizations, community groups, caring companies and employees as well as volunteers are organizing local walks, runs, rides and other events to raise awareness about depression and other mood disorders and to help reduce the stigma that, for far too long, has cast negative perceptions on mental illness. Many of these community organizations are struggling to try to keep up with the increased demand for services. This campaign raises funds to assist these non-profit organizations deliver services and supports. The funds raised at these events go to the community mental health organizations that provide critical support and services which greatly help improve the lives of Canadians experiencing depression and other mood disorders. Depression impacts virtually every Canadian family. 20% (1 in 5) Canadians will experience a mental illness or problem. Four to five percent (4-5%) of Canadians are depressed at any one point in time, (roughly 1.5 million). There is no one specific cause of depression. It can be triggered by traumatic events, a biochemical imbalance or through experiencing a particularly negative experiences or outlook on life. A family history of the illness can also position you to being more prone to depression than others. Of those who develop depression/anxiety, only about 20% will receive adequate treatment. Astonishingly, 97% of persons reporting depression/anxiety also report that their work, home life and relationships have suffered as a result of their illnesses or due to illness within their family. Depression is a common mental disorder, characterized by sadness, loss of interest or pleasure, feelings of guilt or low self-worth, disturbed sleep or appetite, low energy and poor concentration. Physical activity such as walking, running and social interactions have a positive effect on our mental health and helps tackle depression. These events across Canada are the perfect way for family, friends, co-workers and persons who are affected by depression to all come out and support positive mental health! Everywhere, people Move for Mental Health! For far too long mental health issues were kept behind closed doors instead of being discussed. Through the Defeat Depression campaign, Canadians now have a campaign that offers an effective tool to do something together that has an immediate and positive effect on their family, friends and neighbours. Today, especially among our youth, people are eager to take part in activities that tackles mental illness and fights stigma. The Defeat Depression campaign provides a wonderful way for everyone to take a stand against stigma while supporting local mental health services and supports. The campaign has more than doubled in one 1 short year and will continue to dramatically grow because it delivers what families and communities want.